Decked out in a pink sweatshirt and stylish purple glasses, 7-year-old Frannie Ohlhoff is making a classic sales pitch: "My Girl Scout troop is selling cookies. I was wondering if you were interested in buying some." But Frannie, a second-grader from Oak Park, Ill., isn't peering around a neighbor's door or greeting strangers at a traditional sidewalk sales table. She's speaking in an online video embedded in her official Girl Scouts digital-sales page. "It was wonderful because our family is all out of town, and they love to be involved with our kids," said Frannie's mother, Alison. "Having the tool in place where they could buy cookies from her so easily was awesome." 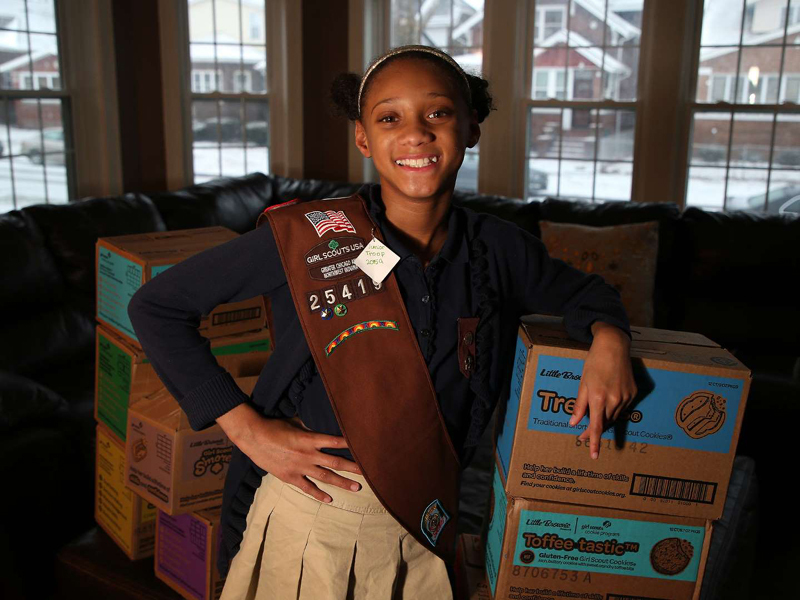 Other Girl Scout councils have been rolling out the Digital Cookie option since 2014, but the Girl Scouts of Greater Chicago and Northwest Indiana waited to be sure the technology was as easy to use and as glitch-free as possible, according to the council's public relation's manager, Britney Bouie. Bouie said this year's introduction has run smoothly, and a total of 559,486 boxes have been sold digitally so far. Customers can expect to see Girl Scouts selling at booths in public places starting Friday. Information about booth sale locations and ordering online is available at the Chicago council's website. Chicago Girl Scouts sold 4.4 million boxes of cookies last year using traditional methods, and Bouie said that while digital sales will likely increase in coming years, the Chicago Girl Scouts don't forecast that digital sales will become dominant. "We definitely have our longstanding history of selling the cookies, our longstanding history of being out in the community, so how do we use technology to continue to actually bring that in the same way?" she said. "It's just a little scary as a mom, because you don't know what you're going to get," Nichole Hurst said of door-to-door sales. "You don't know how receptive people are going to be, and if it's a good time to catch them, and exchanging money can just be a little weird, especially with strangers." "I took a picture, and I put it on the Digital Cookie page, and I also made a video, and the video was about what kind of cookies there were, how much (I wanted to sell), what I wanted to do with that money and how the money helps our troop," she said. "With that money, me and my troop are going to donate to a pet shelter: donate some toys, some food, stuff like that." Clarissa Beyah-Taylor of Oak Park, Ill., a communications executive and the mother of an 8-year-old Brownie, said the Digital Cookie program is a valuable addition: "It really builds digital communication skills that are key in this day and age, and it's safer than trolling the streets, and it's a lot more comfortable in the cold." "I wanted her to have that experience of knocking on the door and asking someone to buy from her," her mother said.